Imagine the cool crisp air, Thursday, February 4, 2010. The temperature’s unseasonable again, creasing 40. Stepping out into the day, deep breaths are taken across the city. The sun shines off the glass-clad skyscrapers along the Chicago River. The Brown Line clatters, clickety-clackety and clean as a toy over the bridge above the waters. A tall boat’s coming through, it’s after morning rush, the bridge tenders point State, Dearborn, LaSalle, Franklin, to the nourishing sunlight. There’s a cloud in the sky, a large white shred, moving west slower than a stagecoach, as if it’s been part of the prairie forever. The first rumble is more like a grumble. Cheap car alarms on cheaper cars sound. Antsy cats rise to fearful attention. The skies go still. The air stalls, hum of man and nature just hangs for an instant before the rumble comes. It’s always an abstract apocalypse until it occurs next door. Tragedies are what happen through the television screen, the Internet, right, much farther than arm’s length? The first shocks struck Port-au-Prince on January 13, the largest being measured at a 7.0 magnitude. Aftershocks greater than 5 struck on Sunday. More than 150,000 bodies have been counted. A terribly poor country ransacked by its leaders and history is now poorer still. Hourly indignities deepen into despair. Water stops, no flour arrives, bread’s not baked, there are not enough blades for hacksaws for emergency amputations. 1,844 miles away, detached outpourings of genuine concern share conversation with small talk of modern-day Chicago annoyances, like railing against the parking situation or comparing cellular service dead spots over coffee or wine. It could never happen here, could it? Preparedness may be the modern world’s bane. Our hearts are rent when terrible devastation occurs, but we like to think it won’t happen here, wherever our “here” happens to be (that doesn’t include those who build on flood plains, on the side of a California mountain or in a tornado alley). There but for the grace of God go I, but where do we go from here in the case of even the most unlikely event? Chicago, in its history, is no stranger to disaster, from the Great Chicago Fire of 1871, which killed nearly 300 and left thirty percent of the city’s population homeless, to the heat wave of 1995, which killed up to 600. There are agencies in the city and state that are designed to prepare communities for natural disasters; they operate on the assumption that anything can happen. However, further complicating their job are the varying degrees of unlikelihood natural disasters will occur in Chicago—Haydar Al-Shukri, director of the Arkansas Earthquake Center, insists that an earthquake could not, at least not an earthquake spawned by the well known New Madrid fault. The Wabash Valley fault, which is located just east of St. Louis, might be a bigger threat after all; it has produced three earthquakes with a magnitude over 5 in the last twenty years. Statewide, the Springfield-based Illinois Emergency Management Agency, or IEMA, provides assistance in the case of emergency not only to disaster relief in Illinois, but also to areas as far-reaching as Wisconsin and even Minnesota. Velasquez is quick to point out that Illinois is not immune to natural disasters and that, with the abundant flooding in 2008, there have been nine Presidentially declared disaster areas in Illinois in the last three years. Velasquez says that the growth of social media, such as Facebook, also helps assist emergency-response agencies in providing the public with anticipatory tips, plus frequent updates if an emergency does indeed occur. In other words, Illinois’ emergency-response programs continually improve. 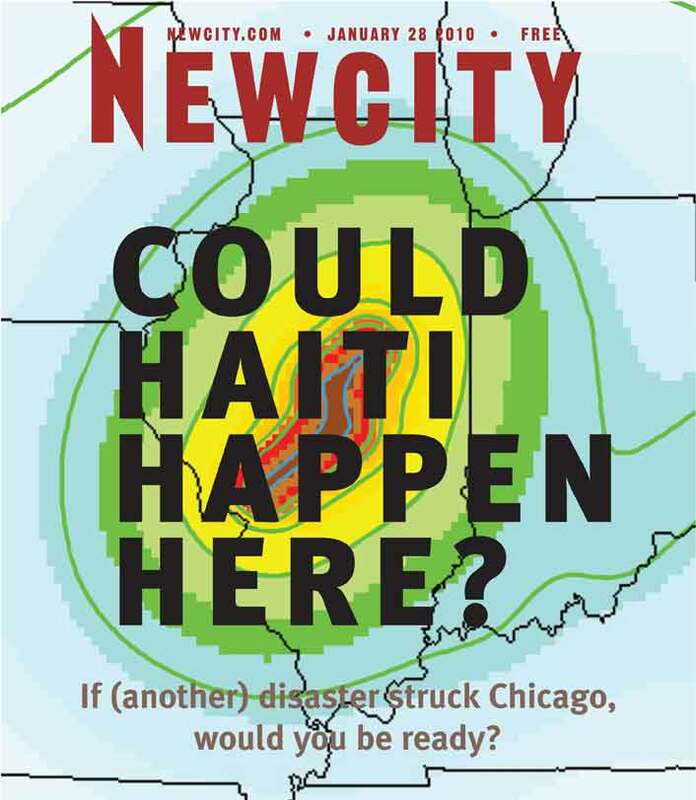 Chicago isn’t likely to have an earthquake of Haiti-like magnitude. The City of Chicago is in a low seismic area and the City Building Code does not require design for seismic, or earthquake loads. But, “If the Big One hit, we would be in trouble,” one structural expert, not wanting his name used making such a bold statement, told us. From the distance of almost 200 years, the worst earthquakes recorded within the U.S., the New Madrid earthquakes of 1811 and 1812, recede into lore. Across 50,000 square miles starting in the Mississippi Valley in Missouri, with shocks felt as far as New York, the world shook. The rivers ran backward, the mighty Ohio. Even the birds in the sky cried their surprise. It was worse than the 1906 San Francisco quake. That area is still active: could it reach from Memphis northward even to the Magnificent Mile? Most cities, counties and states now have building codes based on the 2003 or 2006 editions of the IBC, Ghosh says. “According to seismic hazard maps in these codes, seismic hazard is low in downtown Chicago and to the north and west. However, as you go to the south, southwest or southeast of downtown, the seismic hazard is not insignificant any more and needs to be considered in design.” Most Chicago suburbs have adopted these standards, but the Chicago Building Code itself has fallen behind the times, he adds, with the 2000 IBC still not adopted by the City. “This is a situation that needs rectifying, although there definitely is no immediate cause for alarm,” he reassures. In the early hours of April 18, 2008, some of us were awoken by an unnatural rumbling, a 5.2-magnitude earthquake that centered near the Southern Illinois town of West Salem. Though the quake was felt as far as Alabama and Nebraska, there was little structural damage to be found and no person was hurt. The earthquake spawned from the Wabash Valley Seismic Zone, adjacent to the New Madrid. Anna Mae-Williams, a West Salem resident, told the Chicago Sun-Times that she thought the house was falling down on her.